Researched and curated the first ever anime programme at a British convention at Eastcon 90. Founded and edited the first regular anime newsletter in Britain, ANIME UK, from 1990; it morphed into the first British professional anime magazine in 1991. Attended Sheffield event Animeday 1991-4, chaired the 1994 convention AUKCon at the Conway Hall, Red Lion Square, London. Wrote the first book in English dedicated to Japanese animation in 1993, co-authored the first book on an anime genre in 1998, and wrote the first book on a single anime director in 1990. Co-authored 'the Haillwell of anime', THE ANIME ENCYCLOPEDIA, in 2001. ANIME UK magazine won the Osamu Tezuka Award in 1995. 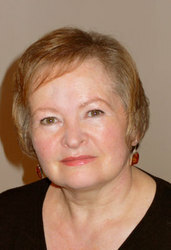 Helen won the Japan Festival Award for outstanding contributions to the understanding of Japanese culture in 1997, and the IMAF Award for Outstanding Achievemtn in 2006.